The Holy Trinity Monastery is one of the most important monasteries in the history of Crete, that offered to the overall culture and education of the people of Crete. Located at Akrotiri peninsula, just 15 km outside of Chania, with a car hire it is easy to reach. The architecture enthusiasts will be impressed by the facade of the monastery, with Doric columns and many Renaissance elements. The monastery is open since 1634, impeccably maintained both inside and outside, with beautiful landscaped gardens. When you visit the monastery, do not miss the chance to admire the exhibition of wood carvings and the rare and large library of the monastery. Unfortunately, a large part of the relics were destroyed by the Turks during the Greek revolution. The repairs after the damage that the monastery suffered, were completed in 1830. 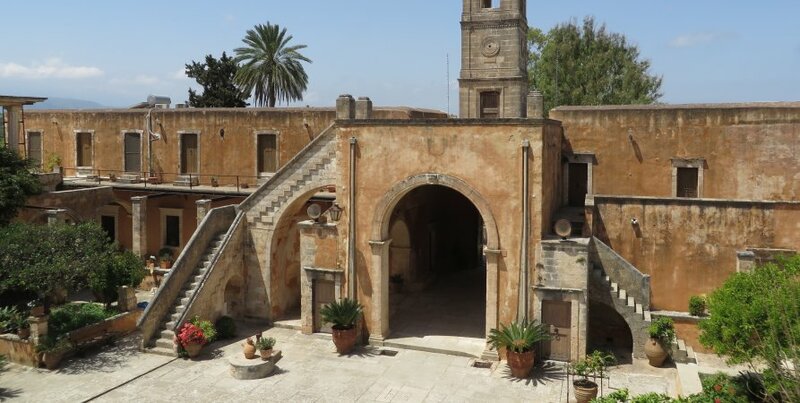 The monastery was built by two brothers monks Laurentius and Jeremiah, two highly educated persons, architectural connoisseurs with great influence in the Orthodox and the Catholic population of the island.